NOTE: Don't miss my magazine feature article about digging trilobite fossils in the House Range. HIGHLIGHTS These mountains are full of surprises. Marjum and Dome (or Death) Canyons are noted for high, terraced walls and side canyons. 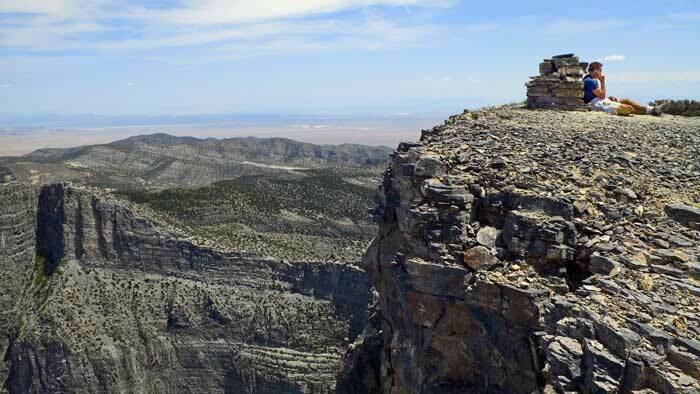 The 4,000-foot-plus west side of 9,655-foot Notch Peak [N39°08.590′ W113°24.560′] is famous for its sheer, roughly 2,000-foot cliff. Hikers who climb to the summit are rewarded with a 360-degree panorama at the very brink of the cliff. Near the summit is a large stand of bristlecone pines, among the world’s oldest living things. Sinbad Overlook also provides top-of-the-world views. The gravel road through Marjum Canyon is a relic of the original unpaved U.S. 6/50, replaced by the paved highway in 1950. If you have the time, add the drive up to verdant Amasa Valley, on Sawtooth Mountain. There you will find granite boulders and outcrops, aspen groves, creeks, meadows, and the vista from atop 9,290-foot Pine Peak. The range’s dramatic uptilted west side has canyons worth exploring as well. 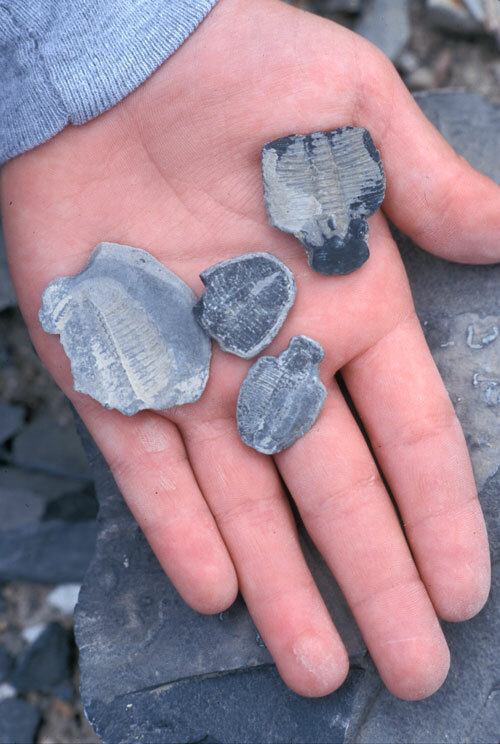 The limestone and shale here reveal a Paleozoic record dating back to the Ordovician and Cambrian periods 438–570 million years ago, when trilobites, primitive hard-shelled marine invertebrates, left their imprints in a primordial seabed. Today, the House Range is noted for abundant trilobite fossils. Recreational collecting is allowed. You’re guaranteed to find them at U-Dig Fossils, a commercial quarry. Visit in spring and fall. 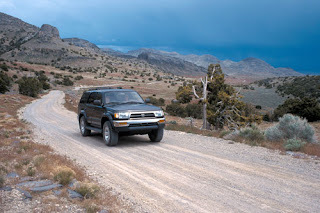 DIFFICULTY Marjum and Dome canyons are easy, on maintained dirt-and-gravel county roads. Sawtooth Mountain, via North Canyon and Amasa Valley, is easy to moderate. 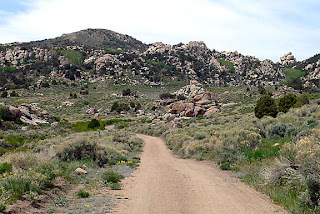 The high-clearance road up Miller Cove to the Notch Peak trailhead, at the entrance to the narrows of Sawtooth Canyon [N39°07.677′ W113°21.830′], is rocky but easy. The high-clearance road to Sinbad Overlook may be rocky and rutted, but still easy. The strenuous 8.2-mile (round-trip) Notch Peak hike took me about 8 hours, including lots of time at the summit. Many do it in less time. MAPS Benchmark Map's Utah Road & Recreation Atlas, pp. 64–65 (A, 6–8) and 56–57 (F–H, 6–9). BLM’s Tule Valley. Also see the Bureau of Land Management’s House Range & Warm Springs Recreation & Vehicle Guide. INFORMATION BLM, Filmore Field Office. U-Dig Fossils. GETTING THERE Zero your odometer at the U.S. 6/50 bridge in Delta, and drive west. Almost 32 miles later, turn north at the sign [N39°03.534′ W113°14.965′] for U-Dig Fossils (20 miles) [N39°21.192′ W113°16.833′], Death Canyon (21 miles) and Marjum Pass (21 miles). My preference is to continue west on U.S. 6/50 for another 10.2 miles, toward Skull Rock Pass. Turn north onto the dirt road at milepost 46 and the “Old HWY 6 & 50” sign [N39°03.552′ W113°14.958′]. This is where I begin my description. REST STOPS There is primitive camping throughout these mountains, including at the Notch Peak trailhead (the ground is rocky); on Sawtooth Mountain (check out the aspen grove at N39°10.601′ W113°24.404); in Miller Canyon, popular among OHV riders; and among the pinyon pines and junipers in Wildhorse Canyon [N39°21.040′ W113°19.323′], north of Dome Canyon Road. There is a vault toilet at the Miller Canyon OHV staging area [N39°08.489′ W113°18.465′], near the entrance to Miller Canyon. Water is available at the roadside spring at a major turn [N39°18.802′ W113°14.862′] to Dome/Death Canyon, and at Antelope Spring [N39°22.508′ W113°17.642′]. THE DRIVE The county road runs through the undulating desert along the eastern base of the mountains. At mile 4.3 [N39°06.735′ W113°13.218′] Miller Canyon Road branches left (northwest) into the mountains. For the hike to Notch Peak, you can take Miller Canyon Road 5.1 miles toward Miller Canyon, but bear left (southwest) at the sign for Sawtooth Canyon, across from the Amasa Basin OHV staging area. Then drive 3.3 miles up Miller Cove, eventually passing a stone cabin on the right not far from road’s end at the Notch Peak trailhead. There are other access roads; refer to your detailed map. To continue the tour from the Miller Canyon Road turn, continue north toward 9,678-foot Swasey Peak. Bear left (northwest) at mile 13.3. At mile 15.1 [N39°15.644′ W113°11.298′] is the left (west) turn onto old U.S. 6/50 to spectacular Marjum Canyon. Pass this turn, and continue northwest to a four-way junction at about mile 19.9 [N39°18.802′ W113°14.862′]. Continue northwest, heading into the mountains, toward U-Dig Fossils, Antelope Spring and Dome Canyon (a.k.a. Death Canyon, perhaps after pioneers said to have frozen to death there) Pass. Soon you will reach the entrance to U-Dig Fossils. Just beyond it is a junction [N39°21.209′ W113°16.914′]. To the left is the road through Dome Canyon. The road to the right ends at Sinbad Overlook and its view of Tule Valley. The road through Dome Canyon descends west between towering, terraced cliffs incised with side canyons. After you drive over Dome Canyon Pass and exit Dome Canyon into Tule Valley, turn left (south) at a T junction [N39°20.749′ W113°25.400′], marked by the hulk of an old truck. Note your odometer reading here. In 6.8 miles is the left turn [N39°15.520′ W113°27.608′] onto Old U.S. 6/50 to Marjum Canyon. If you choose not to explore Marjum Canyon, you can continue south to the modern highway in about 14 miles. But the drive through Marjum Canyon is a House Range highlight. So, note your odometer reading at this junction and head east into the canyon. About 3.2 miles from the junction [N39°14.654′ W113°24.319′], a dirt road branches to the left (north) into a beautiful and narrow high-walled side canyon. The little road ends in a short distance. From there, a foot trail leads through the brush and, again in a short distance, reaches the site of the so-called Hermit’s Cabin [N39°14.890′ W113.24.179′], in an alcove to the left. It was occupied by Robert Stinson from 1920 to 1945. Stinson (1880–1960) was a native of Iowa and a World War I Army veteran. As the story goes, he was suffering from what was then called “shell shock” and which might today be considered post-traumatic stress disorder when he hitchhiked to Delta after his discharge in search of peace and isolation. 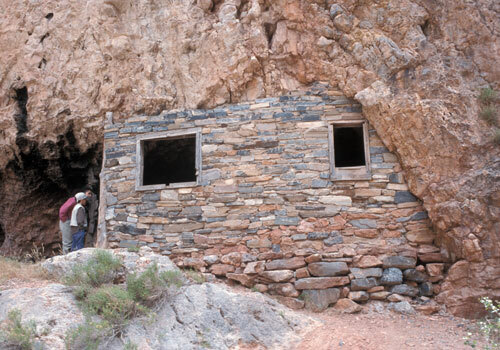 He worked for the state highway department removing rock from the old “highway” that ran through Marjum Canyon and over Marjum Pass, and in spring 1920 he made a home by turning a small cave in this canyon into a one-room stone cabin. Stinson is credited with saving the lives of some individuals and assisting others who were caught in flash floods that occur in the area. Continue over Marjum Pass to the road you were on earlier in the tour, on the eastern side of the range, which will return you to the highway. Or backtrack from Marjum Canyon and drive to U.S. 6/50 along the range’s uplifted west side. If you want to explore more this fascinating range, drive up Sawtooth Mountain and Amasa Valley. To do so, make your way to a point [N39°14.895′ W113°15.440′] on Old U.S. 6/50 about 3.8 miles west of the junction that noted previously at mile 15.1. Zero your odometer. Here, a road extends to the southwest. (It’s Route 1 in the Amasa Basin OHV trail system.) It begins at 7,785 feet elevation, and climbs through North Canyon to reach Amasa Valley in about 8.6 miles. It continues through the valley, or basin, and higher on Sawtooth Mountain and the crest of the House Range. At a junction at about mile 10.9, bear right and drive to the 8,890-foot summit of Baldy [N39°11.267′ W113°24.579′]. Note your mileage when you return to the junction. Continuing south along a ridge, in 0.7 mile you will come to an aspen grove amid granite boulders that is a great primitive camping spot. About 1.3 miles from the turn to Baldy, stop at an old mine site and continue afoot a short distance to the summit of Pine Peak for superlative views. To climb to Notch Peak, from the entrance to Sawtooth Canyon hike through the narrows to where the canyon opens up, about 0.7 mile. The trail will fork. Take the left fork, marked by a cairn, then follow the meandering, rocky and beautiful ravine steadily higher to a saddle at very rim of a sheer canyon cliff [N39°08.590′ W113°24.400′]. From here, climbing higher to the left (west) along the rim will bring you to the summit. If you go right from the saddle, along the rim, and around the west side of a knoll, you will come to a grove of bristlecone pines in less than a half-mile.